When I first wrote in 2006 about Frank Brangwyn, the superbly accomplished painter, muralist, watercolorist, illustrator and printmaker, there were only a few scattered resources on the web, and very little in the way of available books or other printed material. Since then, more resources have become available on the web, and I’ve listed some of them below. Though no new books have become available there is a wonderful new portfolio of some of his best graphic work. 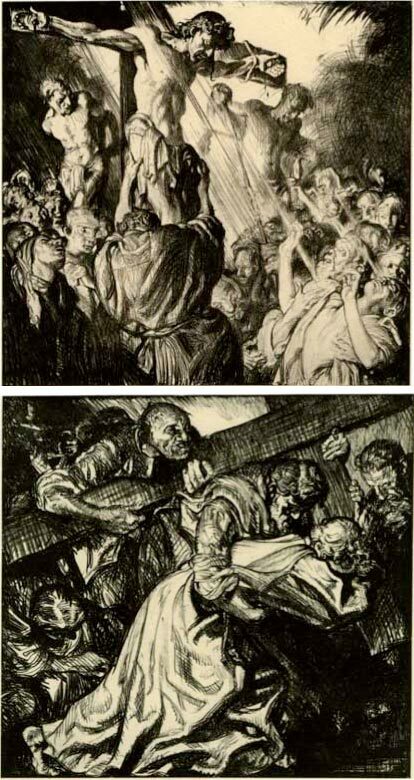 Auad Publishing, a small imprint that specializes in beautifully produced books of the work of classic illustrators and comics artists (see my post on Franklin Booth), has created a faithful reproduction of a 1935 portfolio of lithographs, Frank Brangwyn, R. A.: The Way of the Cross. This is a lovingly produced set of 20 plates, printed in letterpress (rare these days except for high end art reproductions) on 11″x14″ 80lb textured stock, in a deluxe fourfold portfolio. The beautiful production values are quickly overshadowed by the power of Brangwyn’s drawings; powerful both in the sense of the emotional drama of their depiction of the Stations of the Cross, an in Brangwyn’s masterful drawing style and striking compositions. In his work as an illustrator, Brangwyn acquired a great sense of design, and his classical training gave him the solid, finely honed draftsmanship that is the foundation of his influential style, but it is his own emotional investment in the subject, and his remarkable mastery of chiaroscuro, that bring the drawings to life. The portfolio has an essay by Dr. Libby Horner, who is probably the world’s foremost authority on Brangwyn and his work. Dr. Horner created the frankbrangwyn.org web site (which is not heavy on images, but has lots of useful information about the artist, including a list of books he illustrated and links to other Brangwyn resources). In Brangwyn’s drawings you can see the influence of Rembrandt and other great printmakers, and the drama of his own style that so heavily influenced the great illustrator Dean Cornwell (also here) and many others. There is a small preview of the Way of the Cross portfolio on the Auad Publishing site, from which I’ve borrowed the images above (click on the image in the page for a pop-up gallery). The small images here and on the Auad website don’t do the portfolio justice, but those who are already aware of Brangwyn’s accomplishments will want to be aware that the portfolio is limited to 700 numbered copies. This guy is boss. It’s good to see his star rising again after so many years of relative obscurity. 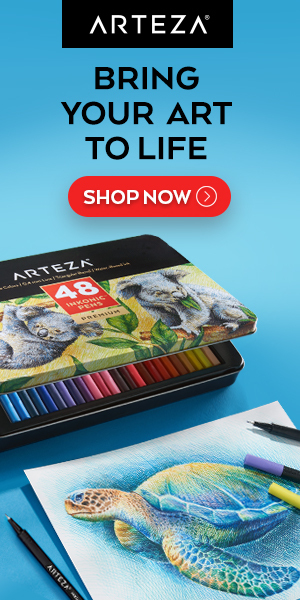 His monochrome work gives you ten drawing lessons per print. Where is his equal today? Other readers should check out Carl Critchlow’s terrific Magic the Gathering illustration and comics work. Also, see my post on Carl Critchlow.